I had every intention of serving these as a little pre-Thanksgiving dinner hors-d’oeuvres for my guests, but somebody (I won’t name names) put it into my head that these were a potential source of great messiness due to rolling berries and so I nixed them from my holiday menu and now I’m kicking myself and I sort of want to kick him too, (he’d better not hog the covers again tonight!—Oops, have I said too much?) because we definitely could have used a nibbly while my mom and I were navigating how to get the turkey carved and all the dishes out at the same time and everyone was just standing around, waiting. But do I hold a grudge? No siree! 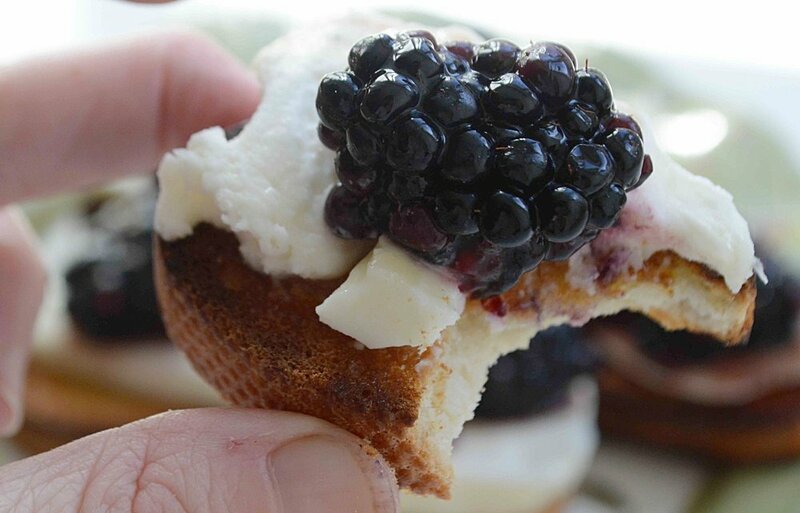 I love him still, almost as much as I love these Blackberry and Mozzarella Bruschetta. LOL! And I know you’re going to love them too, because not only do they taste terrific and look so pretty and festive, but they also come together in a snap which makes them just perfect for all your holiday entertaining! Behold, the dangerous berries! Ha ha! Seriously, aren’t they gorgeous? Like little jewels! A short stint in a little bit of balsamic vinegar brings out all their natural juiciness and adds just the right amount of sweetness and tartness. They’re the perfect topper! Below the berries is a terrific balance of taste and texture. The still-warm toasts are drizzled with olive oil and then rubbed with a piece of fresh garlic so that great flavor gets infused into every crunchy bite. On top, rests a creamy piece of fresh mozzarella and I don’t have to tell you what a great combo that it is. Then, to add just a little more happiness, a tiny bit of honey gets drizzled over the top of everything! Heaven! Every bite is a little flavor explosion for your mouth and the making of these is virtually stress-free, unless of course you have berry anxiety! And while I’m touting them as a party treat, the truth is that a plate of these with a little salad would make a terrific little easy late supper as well. Don’t be afraid of the berries! Please!!! Place the berries and vinegar in a small bowl. Add a pinch of salt and pepper and toss gently. Then, use the spoon to sort of break up and smash the berries just a little. You don’t want to mash them all up, but you do want to help them release their juices. Let sit for about 10 minutes. Meanwhile. toast the bread—watch carefully—they have a tendency to go from perfectly brown to burned kind of quickly. Remove from the oven or toaster and while the bread is still warm, drizzle a little olive oil on each slice and then rub with the cut side of the garlic clove. Top each slice with a piece of the mozzarella and then spoon on a blackberry or two and some of the juice as well. Drizzle with a bit of honey, add a pinch or salt and pepper and serve. This recipe would double or triple well. Note: Recipe adapted from The Love & Lemons Cookbook by Jeanine Donofrio. The original recipe calls for fresh basil which I didn’t have on hand but I’m sure it would be good with that too.